Yesterday. Today. Everyday, I wake up and feel so happy. I feel like there are fireworks going off inside of me. I have never been more sure of myself than I am today and I am so grateful. My life today is not what I had envisioned a year ago or even six months ago but everyday I move forward with confidence. And everyday, I feel more sure that my life could not be any other way than what it is right now. I don't know what is on the horizon but I see my star continuing to rise. It is so clear. Clearer than it has ever been in my entire life. I will live the life of my dreams and I will have everything that my heart desires and deserves. And I deserve the fairy tale that I have put together in my head that includes my dream job of being a full-time author. I don't know what love looks like for me in the future but I am not in a rush toward anything but taking care of me, for right now. Even though I still straddle that line between rekindling the old or fostering the brand new, I am only concerned about my own mental and emotional well-being. It sounds selfish and you can call it that. I'm okay with being called selfish. It's not the first time or the last since someone has called me that. One can either stay with me for the ride or not. There are no guarantees that I will be the same me a year from now that I am today. I know that new love is magical and exciting. And we find these sparks of fire under the strangest of circumstances. Two souls meet and exchange real energy and chemistry. One can either follow it or let it die where it is and always wonder about what could have been. I am not one to wonder. I am curious and thoughtful about everything and that includes the magic of new love. And I don't know where it will lead. No one does. One thing is for sure - what I know about me is that I am the most loyal chic, ride-or-die, down-for-whatever, and I can be the best partner a man could ever have. That is the real-est truth about me. So whether I follow new love or let my path lead back to old love, when I give my heart, I am giving my life for as long as they will have me. I did it with my first husband and I was there for my second husband and I kick myself sometimes for letting them dictate when they would leave me. And they both left me! I can say that much of my healing has a lot to do with my mind's acceptance of hope for the future. Today and all of my tomorrow's are not so bleak and foreboding anymore. I am actually excited to see what is ahead of me. About six months ago I couldn't even plan 15 minutes ahead because I was so depressed and the world just looked so dark and unappealing. I lost so much weight. I didn't have an appetite. I was just not happy at all. I didn't stay very long in that dark place and I am grateful to have made it out from beneath that grey cloud. I feel so alive in such a genuine way. I almost feel ready to let go of some of the "crutches" I have acquired in the last six months. Almost. I move forward with nothing but positive vibes in my body and a mind so determined to achieve all of my wildest dreams. 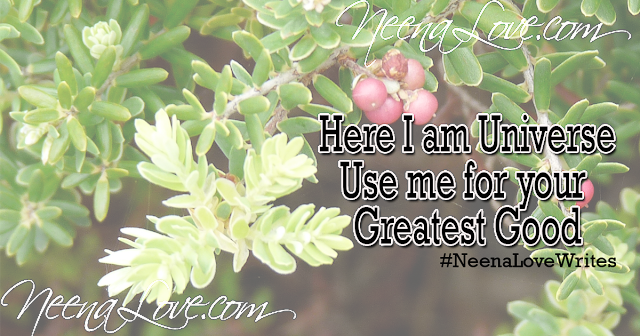 Here I am Universe -- use me for your greatest good!